Do you know what they call Pulp Fiction in Paris ? Le Pulp Fiction. Do You know what they call Reservoir Dogs in Paris ? I dunno I didn't go to Burger King. If you would have asked me five years ago what I thought the greatest film ever made was, I most likely would have answered with 'Pulp Fiction'. This is a film that I used to watch about five times a week and used to know like the back of my hand, but over the years I have seemingly convinced myself that maybe it isn't as great as I once thought it was, that is until I rewatch it and fall in love with the film all over again. This has been a process that I have been repeating for quite a while but after a spontaneous viewing that took place just now, I don't think I can question 'Pulp Fiction's greatness ever again. A film that consists of Four interwoven tales centered around Two Hitman, A Gangster's wife, a Boxer and a pair of bandits. I believe I will always stand by 'Reservoir Dogs' as being my favorite Tarantino film, but 'Pulp Fiction' is a very close second. There are few films that are more iconic and have become more embedded in pop culture like Tarantino's 1994 Gangster film, While I think it may detract from the films everlasting impact, it is still a hell of feat and a testament to Quentin Tarantino for being able to personify the 90's in his film. Due it's pop culture phenomenon status, It is possible to overlook the fact that it also a brilliant piece of cinema. Plenty of filmmakers attempt to juggle several different story lines in there films but few pull it of like Tarantino did with this film. The film is so intricate and so thoroughly detailed that you can't help but marvel at Tarantino's dedication to creating his own unique world for his film. It's an enjoyable (and difficult) task to attempt to place the sequences in the order of which they are taking place and its for these reasons and more that 'Pulp Fiction' has proved to be such an unforgettable viewing experience for so many audience members. This is probably the Ultimate Tarantino film, when you think about all of his trademarks,quirks and techniques and mesh them all together you would get something that resembles this film. The beautiful long tracking shots, the though provoking and enthralling dialogue. The beautifully abrupt Sally Menke editing and the terrific soundtrack, I believe this film more than any of his others personifies his trademark style. 'Pulp Fiction' features what is probably Tarantino's most famous Screenplay, and what a masterclass it is, you may be able to fault the man for a number of things, but you can't deny his writing skills and his ability to create unforgettable characters. The film features an array of classic quotes and scenes, with my personal favorite being where Mia dances to 'Girl, You'll be a woman soon' which is an incredible scene and features the perfect music choice. Tarantino's has rarely ever failed in getting career best performances from his actors, and that is doubly true with this film as about 90% of the cast give the finest performances of their career in this film. A Tarantino trademark is picking a down and out Actors and giving him the role of a lifetime, the perfect example is John Travolta, whose career was down in the dumps back in 1993 and was having to resort to starring in the 'Look Who's Talking' trilogy. After Michael Madsen did not accept the role of Vincent Vega, Tarantino offered it to Travolta and the rest is history. Travolta gives the best performance of his career in this film and is perfect in his role. I have never been the biggest Samuel L Jackson fan, I honestly think he is overrated, but his performance as Jules in this film is simply incredible and deserving of its iconic status. The rest of the cast is flawless, Uma Thurman is spell binding, Bruce Willis is at his best, Christopher Walken is great, Ving Rhames is frightening, Tarantino is enjoyable and Harvey Keitel is the coolest mother fucker on the planet as Winston Wolfe. 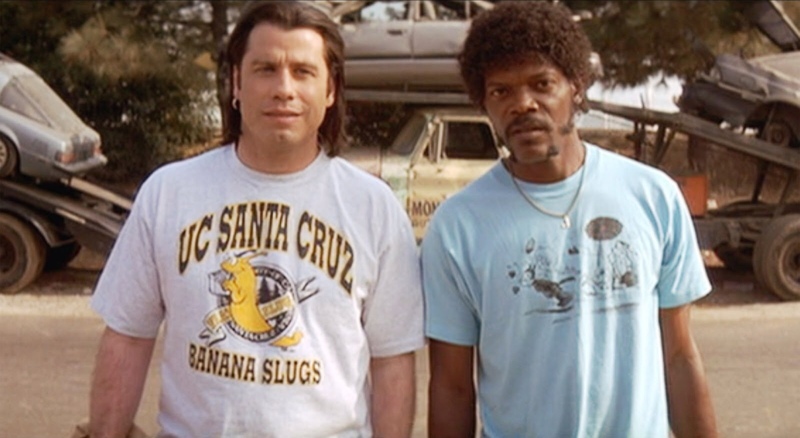 Simply put, 'Pulp Fiction' is a modern Masterpiece. The film is full of iconic moments,scenes and quotes. It's hilarious, frightening, tense and thrilling (sometimes all at the same time). A groundbreaking cinematic achievement from Mr Tarantino.